Audi, the four rings representing the four car companies that grouped together to create the company. Their original slogan “Advancement through Technology” holds true today. Definitive combination of innovated technology, performance and design with German engineering create a line of luxury sports sedans, coupes, and SUVs. Some with Audi’s world renowned race proven permanent 4 wheel drive Quattro® system. European Auto Tech’s master technicians have the skills, training and experience to perform routine maintenance, diagnostics and repair of all models of Audi vehicles. Our knowledgeable and courteous staff has the experience, skills and equipment to affordably diagnose and repair all Audi issues, and provide the regular preventative maintenance your Audi needs to keep it running smoothly for years to come. The following are some of most common services and repairs performed by European Auto Tech for its Tucson clientele. A common problem on both Volkswagen and Audi’s is deterioration of the braided vacuum lines. When this happens it can cause a multitude of driveability issues such as rough running, poor fuel economy and performance, check engine light on and codes set in the ECU. We replace these lines with a quality silicone vacuum line that lasts. The Audi engine’s control unit monitors and controls many systems, including the fuel system, or evap system. If the ECU detects a very slight leak in the fuel tank it will turn on the check engine light and set a fault code despite the engine running fine. Most common problems that cause this to occur are a bad gas cap seal, an evap system purge valve that is not closing all the way or a failed diagnostic leak detection pump. At European Auto Tech we advise against simply “throwing parts on the car” without proper testing. There is more to this system than just the components mentioned, and any number of them can fail. As with all repairs, properly diagnosing the true underlying issue and creating an affordable repair plan is key to returning your Audi to its original performance. The most common issue that creates this noise is the sway bar links. The joints in the links start to creak and the suspension amplifies the noise. While annoying, this is a relative easy fix. Also know to make creaking noises are the ball-joints themselves on the suspension control arms themselves. We can inspect the source of your creaking noise and pinpoint the necessary repair. The upper control arm bushings are common locations for tearing and splitting. The arms no longer are held tight in place and move around, which causes the clunking noise. These bushings do affect the alignment, and will cause accelerated tire wear. The good news is that we can alleviate this issue by simply replacing the bushings instead of the entire arm, provided the ball joint on the end is in good condition. There are also other components in the front end that fail, so it is best to have your vehicle inspected before investing in replacing parts. To save weight and money, plastic rollers and guides and thin cables are often used in Audi vehicles. These components break and the windows stop working. 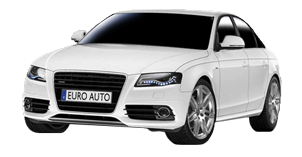 We can diagnose the issue with your Audi’s window and offer affordable repair solutions. The brake light switch tends to fail in Audi vehicles. Depending on the year of your vehicle, the part has gone through many changes and it is important to use high-quality brake light switches as opposed to aftermarket brake light switches. Once we have diagnosed a problem with your Audi, our goal is to share as much information as possible with you, along with our recommended solution in a way that is easy to understand. In many cases, we will discuss different options for repairs and the risks and benefits associated with each. No work is conducted on your Audi without your express permission to do so. Our objective is to always provide you the highest quality repair at competitive pricing, all the while treating your Audi as if it were our own. When it comes to Audi service, we have you covered. Our knowledgeable staff and fully equipped shop will provide you with the most comfortable Audi experience you can have. We will take care of your Audi as if it was our own. Our service includes anything from routine maintenance to complete and accurate mechanical and diagnostic repairs. We offer a comprehensive buyer’s inspection of pre-owned Audi vehicles. We perform a thorough check of major systems, body and chassis, suspension, brakes and drive-train. We then compile a complete report for the buyer giving the buyer a sense of what expenses may be incurred in the near future, how well the car was maintained and the overall condition of the vehicle, allowing you to make the most informed Audi purchase decision. We can perform your required or necessary maintenance services while your Audi is still under factory warranty. We use factory approved parts and lubricants. We will stamp your maintenance book. You are not required to take your Audi back to an authorized dealer for services or maintenance services that you are required to pay for. Contact us for details. Use the form below, or contact us by phone, to schedule an appointment to service, repair or inspect your Audi vehicle at our 1st Avenue shop in Tucson, Arizona. Let our master technicians and courteous staff make you our newest in a long line of satisfied clients.